I'm happy to report another room in our house is COMPLETE! The lucky space?? Our downstairs Bathroom! This little bathroom is a pretty big deal... With the master bath upstairs, this space serves not only as our guest bath, but our powder room for visitors. Given the central location of the bath, and the number of people that would frequent this space, we knew this little bathroom needed to pack a big punch, aesthetically and functionally. 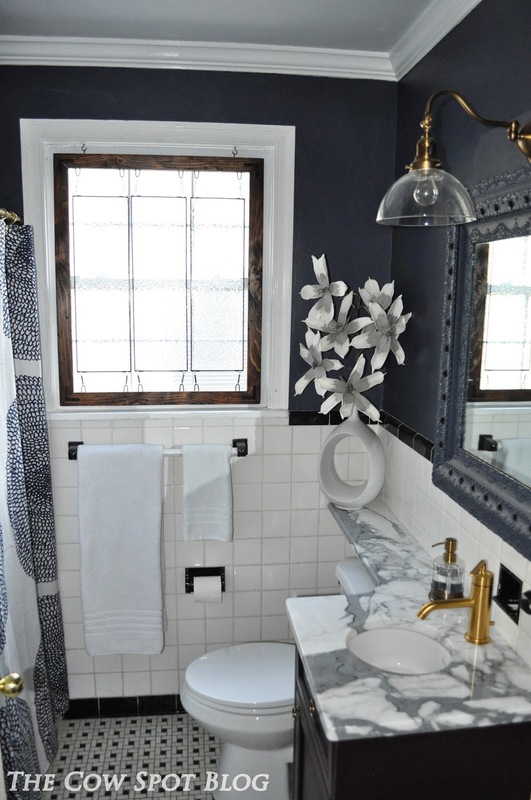 I really wanted the space to feel classic and a bit dramatic, despite it's petite size. Great things come in small packages, right!??!?! This bathroom was once the one and only of the house, so while it is not very big, it does have a full shower/bath that sits directly across from the vanity/toilet wall. While the room is small, the natural lighting is really nice and the space as a whole has great bones. All tile is original to the house and something I was excited to work with. Paint was the first item on the to-do list. I really wanted to paint the walls a dark color, as I said before I was looking for drama and nothing says drama like dark walls. The space is small yes, but I knew no amount of light colored paint was going to change that, so I decided to go for it and paint the walls Navy. Martha Stewart's Wrought Iron to be specific. With the painting underway, it was time to figure out how to increase the storage capacity of this little space. With a tiny vanity and a mirror that doubled as a medicine cabinet, there was really no where to go but up from where we were. In 2012 I posted about a bath remodel we did at Brent's old house. 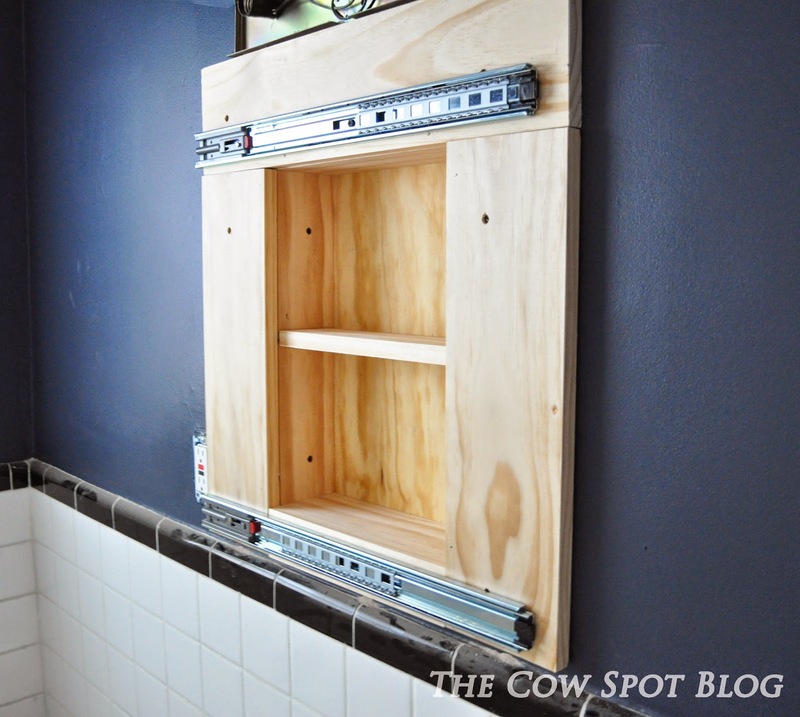 We were working with a similar medicine cabinet situation in this space. 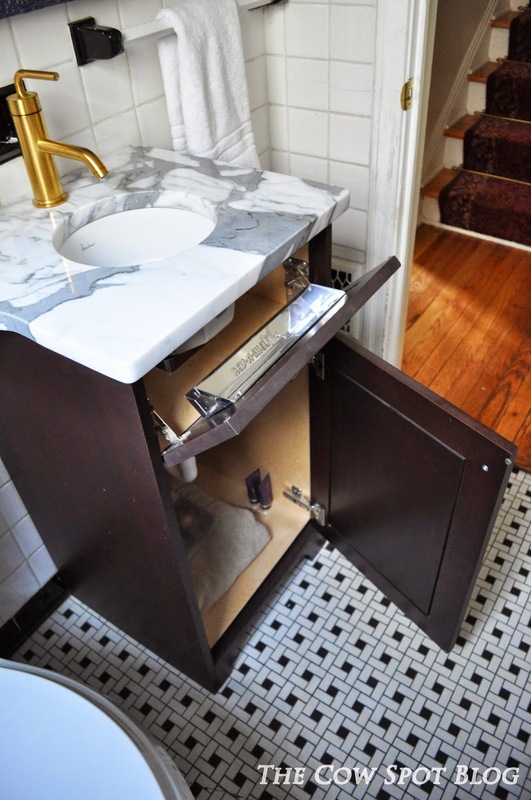 To up the storage and the aesthetic we removed the medicine cabinet and built custom shelves and added a mirror that slid from side to side with cabinet guides. We were so pleased with how well this approach turned out before, we decided to do it again in this space. Brent popped the old medicine cabinet out, framed up a new one, added guides and hung the mirror. For the mirror, we brought the one used in Brent's old house because it was his Great Grandmother's and has beautiful detailing. 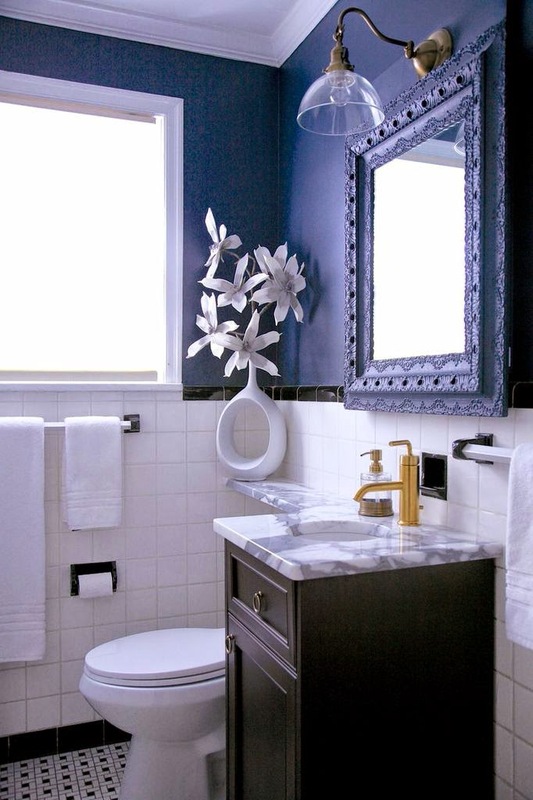 We went back and forth about what color to paint the mirror but ultimately decided to paint it Wrought Iron as well so it would blend with the walls. I love interest layered in through texture as opposed to color. For the vanity I designed a custom cabinet through the company I work for, Bell Kitchen & Bath Studios. We needed this cabinet to be as functional as possible so we made it as large as we could to allow the door to still open and close past it. I designed the false front drawer to flip down to optimize storage capacity. We picked a beautiful remnant piece of white marble for the countertops from Construction Resources. 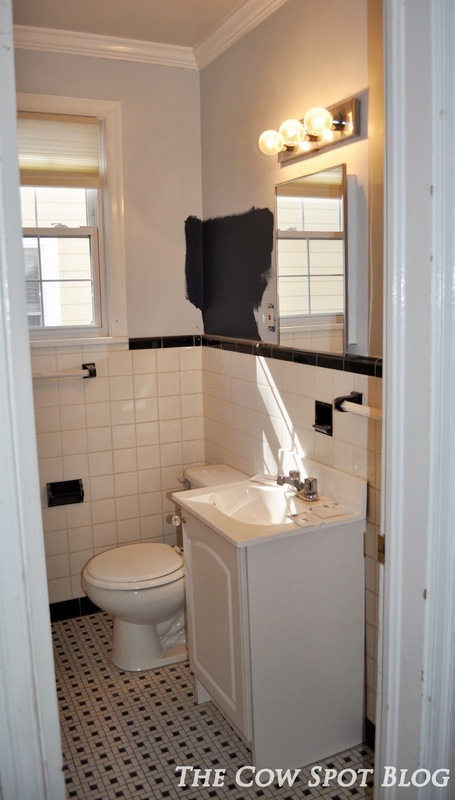 In order to increase counter space we had the top banjo, meaning extend over the toilet to the wall. Not only did this increase the usable counter space but it elongates the room, making it feel deeper. During this update whirlwind, we replaced the toilet (Home Depot), light fixture (Rejuvenation), faucet (Kohler) and sink (Porcher). We also added fluffy white towels and a soap dispenser (Target) as well as a fun shower curtain (Crate & Barrel). Things were coming together quickly and we were able to get the bulk of this space completed before we moved in, making this one of the most finished spaces of the house for a long time. The above photo represents how the bathroom looked for over a year. It was taken by photographer, Barbara Brown when she was at the house shooting the kitchen. We needed a solution that would allow light to come in, offer privacy and be visually pleasing. Once we really thought about it we knew the answer was a stained glass piece. It just so happens Brent's Mom is a stained glass artist, nay genius. 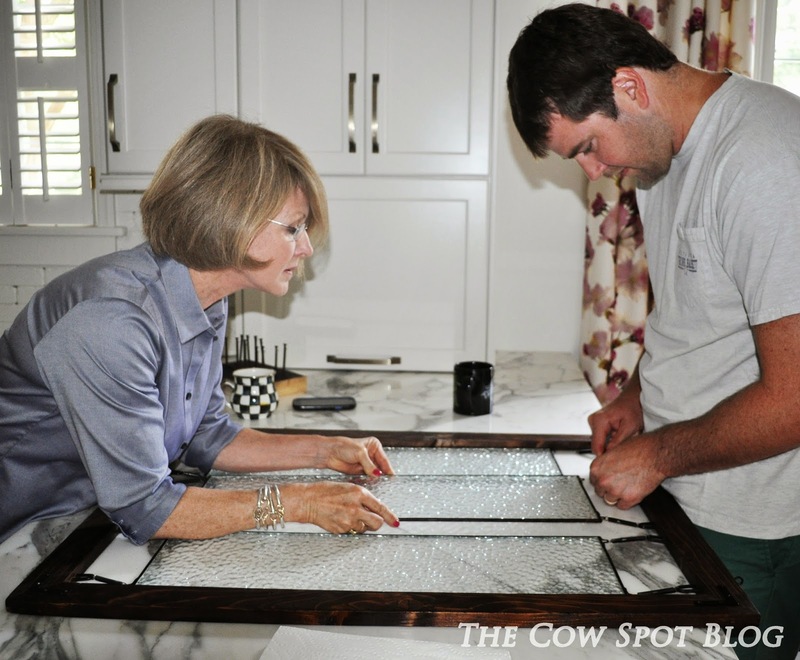 She is the name behind Cindy's Glasswork Designs and she does custom work all over the Southeast; in fact, she made the window we hung in the bathroom at Brent's old house. For this space we wanted something totally different and Brent came up with the perfect concept. He sketched the idea out and talked through the vision with his Mom/Cindy. Once the idea was transferred, things moved pretty fast. Measurements were taken, glass options were presented and the frame finish was considered. A few weeks ago the piece was finished and Cindy brought it up to Atlanta to install. Three panels were designed to virtually float between the frame. The panels are suspended from from springs, giving the piece an industrial - modern vibe. 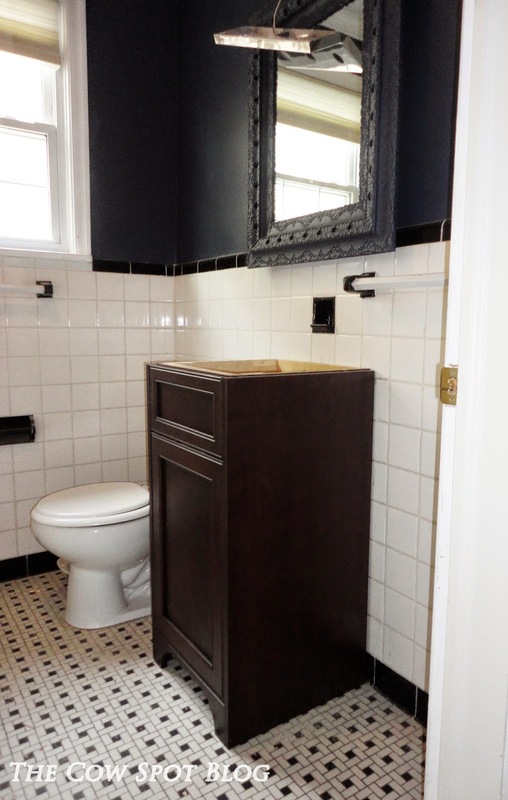 The frame was stained dark brown to tie into the vanity color. 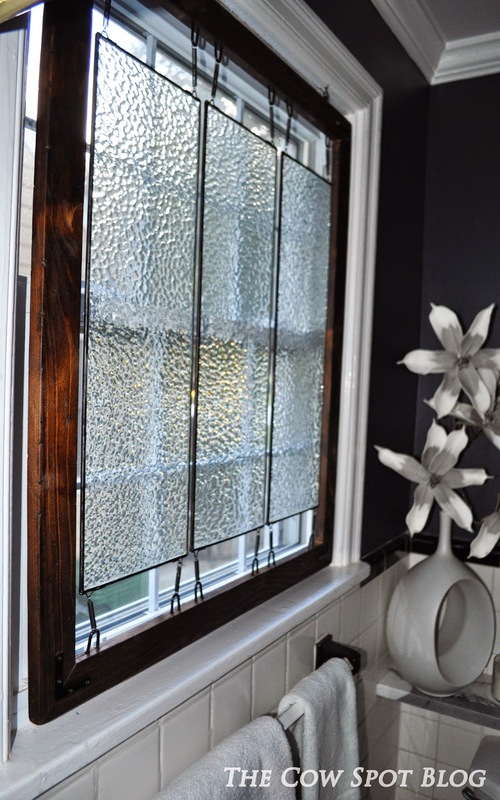 It's unbelievable what an instant impact this stained glass window had on the room. Not only is it a bold focal piece, but it allows light to pour through (so much so that it's hard to photograph) and offers privacy - everything we were looking for and more! We are so happy with how this space turned out. 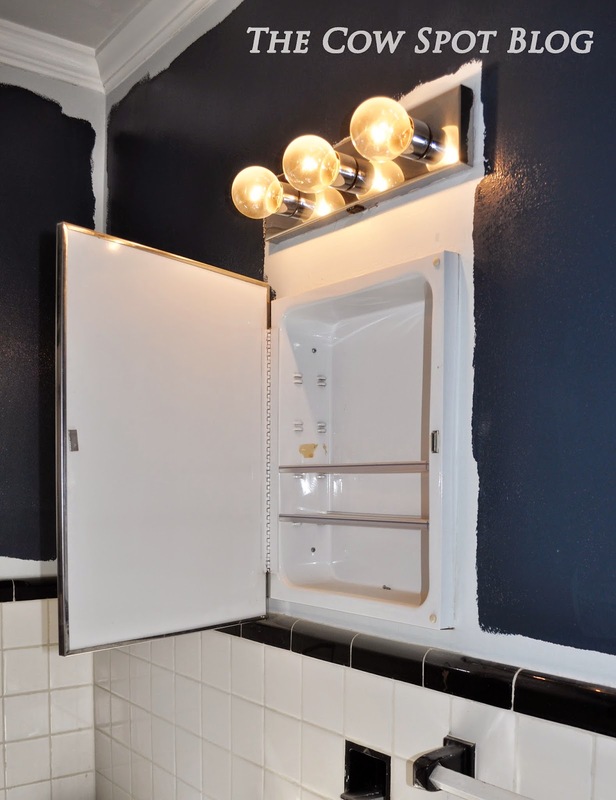 Not only do we love how it looks, but we feel we optimized every inch of functionality we could and really helped this little room be the best it could be!